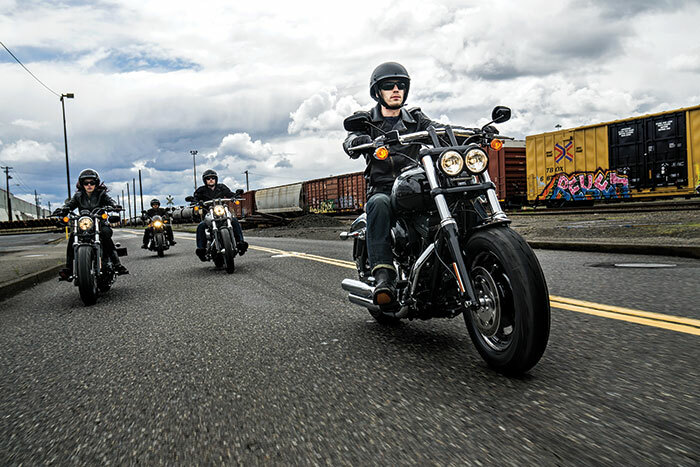 From the double-barreled stare of its twin headlamps to the knobby tread of its burly tires, the Harley-Davidson® Fat Bob® makes a statement that is not subtle. But this motorcycle offers more than attitude. The rigid steel backbone of its Dyna® frame, a pair of thick 49 mm fork legs and chassis geometry that’s tuned to turn make the Fat Bob a cruiser willing to hunt for corners and a blast to ride. Dual front disc brakes haul the Fat Bob down in a hurry. • Blacked-out triple clamps, headlamp trim ring, rear shock covers, and battery box cover. • Five-gallon Fat Bob® fuel tank. • Sport front fender with painted brace supports. • Chrome 1.25-inch diameter drag-style handlebar is internally-wired and mounted on black risers. • Forward-mounted rider footpegs and controls. 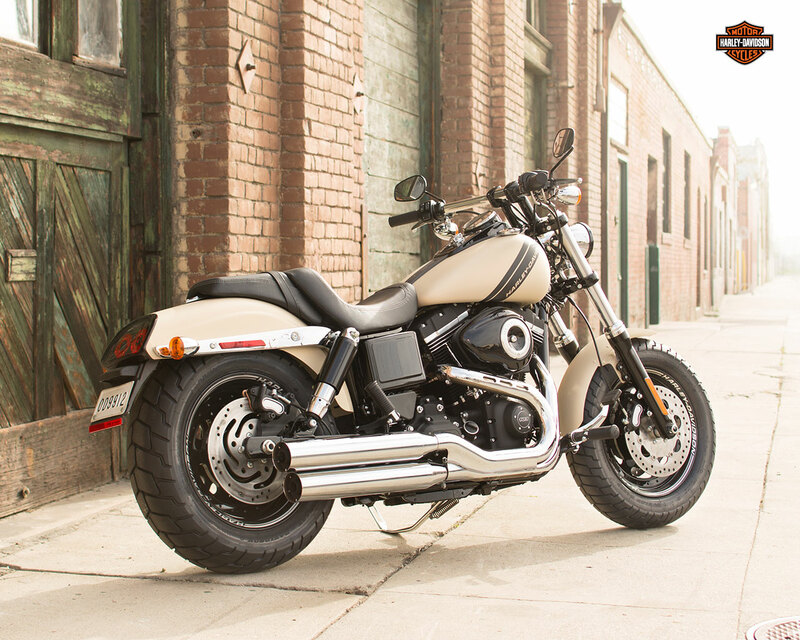 With its wide stance and fat styling, the Fat Bob® comes on like a back-alley brawler: big, bold and dripping with attitude. Muscled up forks, dual headlamps and a 16-inch front wheel wrapped in a 130mm tire give it a menacing, all-business stance and powerful performance. 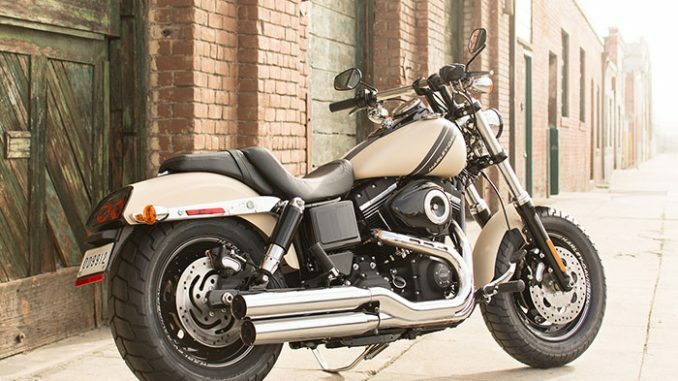 The Fat Bob model proves there’s no such thing as too much black. From the aluminum triple clamps and battery box cover to the headlight trim ring and rear shock covers, this thick-cut, menacing bad boy is blacked out from top to bottom, nose to tail. Go ahead. Flash some black. 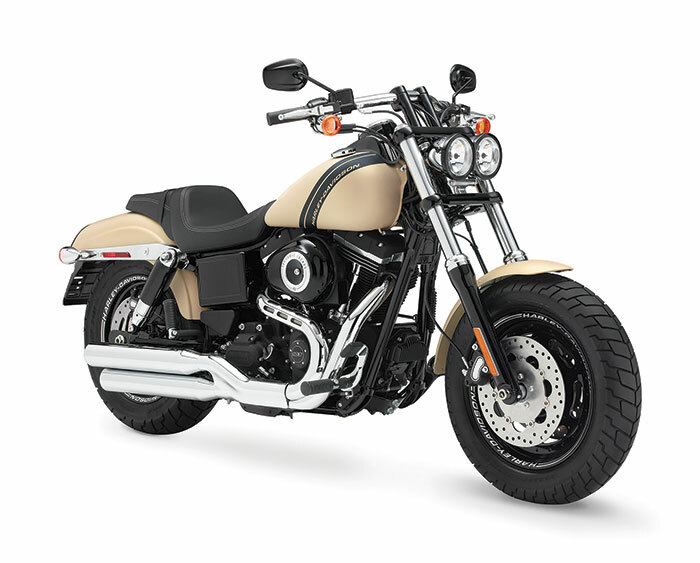 The Fat Bob® motorcycle features an internally wired 1 1/4-inch bar with tall risers. This beefy handlebar is truly reminiscent of an aggressive quarter mile monster. And with the wires routed through the steel, you get a clean, minimal look with nothing standing in your way of the open road. Twice the custom style. Twice the badass attitude. The Fat Bob® model features a distinctive cast chrome double headlamp bucket with a black trim ring. It blasts open the night so you can see everything in your path. And with double the chrome coverage of a single bucket, you’re bound to turn twice as many heads on the boulevard. Stand out, even under the cover of darkness. With the blacked out Twin Cam 103™ cubic-inch, rubber-mounted, air-cooled engine beneath you, the night is yours. And should that notion be questioned, the deep, guttural rumble will make it perfectly clear that giving ground is not an option. Whoever said black was slimming obviously has never seen the burly front end of the Fat Bob. The fat rubber is wrapped around pure black, machined aluminum slotted disc wheels with laser engraved graphics. Even the most formidable stretches of unwelcoming urban pavement will cower out of sheer intimidation. In a world of more, more, more, sometimes just enough is all you really need. These minimal tank graphics give a nod to the stripped-down nature of the bike. At the same time, the diagonal lines match its aggressive stance. No nonsense. No frills. Pure attitude. You don’t need to say much to make a bold statement. This devil is all the way in these details. 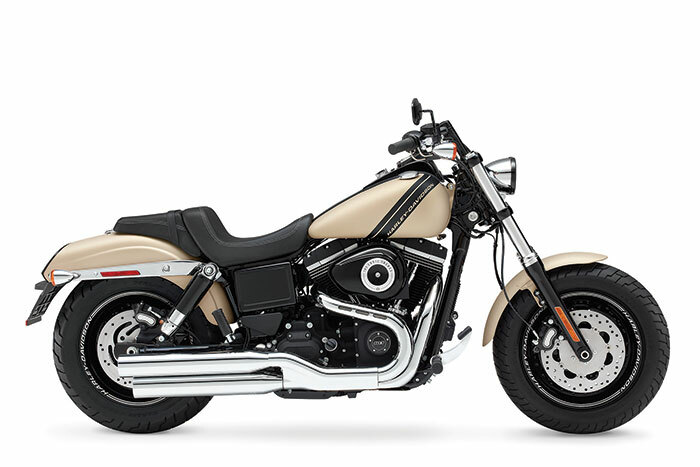 These blunt cut mufflers perfectly complement the aggressive lines of the rear fender, black-covered shocks and tank graphics. This is the Harley-Davidson attention to detail. And it’s the reason our bikes have been grabbing attention for over 110 years. It’s sleek. It’s black. It keeps an ultra-low profile. This tank console with 5-inch gage and integral ignition switch gives the Fat Bob a true custom look, for those who refuse to blend in with the herd. Let’s just say it’s about the minimum amount of rear fender allowed by law. Slash-cut rear with chrome support, this fender won’t hide your rubber from anyone you happen to blow by. And the dual ring LED tail lamp complements the twin headlamp out front. Which means that even in the dark of night you’ll still turn heads. We’re the last ones to screw with a good thing. Which is why the Fat Bob® model comes with the same high-performance, coil-over rear shocks revered by so many riders. But with a little less chrome and a lot more black. Trust us, only the eye will perceive a difference. You spend a lot of time in the saddle, so we spent a lot of time designing a better one. This two-up seat is sleek and ergonomically sculpted to fit as comfortably as your leather jacket. And it puts you in a riding position that commands instant respect in whatever town you happen to be rumbling into. Saddle up and raise a little hell. Who knows, maybe you’ll pick up a friend along the way. With the custom forward-mounted controls on the Fat Bob® model, you can kick back a little and stretch your legs for the ultimate cruise through town or across the state line. It’s time to take in the open road the way you were meant to—on a two-wheeled machine that’s built to outdo the rest. Weight, As Shipped 673 lb. Weight, In Running Order 706 lb.